Login to your PowerYourTrade account with your registered Email ID and Password. PowerYourTrade is subscription based service that provides real-time recommendations and investment opportunities to help you maximize returns on your investments. The recommendations are based on in-depth research and advice conducted entirely by the respective experts/brokers etc. Provides hand-picked daily intraday stock recommendation, Tips & Alerts through SMS, sourced directly from renowned brokers. Multibaggers are compelling, undervalued investments giving enormous returns to thousands of subscribers consistently. Did you invest in these hidden gems at the RIGHT time ? These experts are amongst the renowned & highly respected names in the securities industry - Karvy, Ventura, Motilal Oswal, KR Choksey etc. They are constantly researching & monitoring performance of various stocks under constantly changing market conditions. The research helps them provide views and recommend investment opportunities with an aim to help build a profitable portfolio. To ensure most of the members of these packages get the benefit of this service and are not disturbed by recommendations from uninterested segment there are customized packages available. Click here to see samples pages of PowerYourTrade on real website. 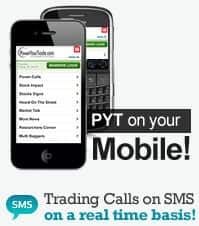 Get handpicked trading calls directly sourced from experts and brokers on SMS before markets open and on a real-time basis with trading ranges, exit and entry points, breakout signals and more. The experts will help you to get you those life-changing stocks, tomorrow's bluechips today. Find hidden gems that are likely to gain steadily, and safely here. Get handpicked commodity calls from experts and brokers on SMS before markets open and on a real-time basis with trading ranges, exit and entry points, breakout signals and more. If you like it, only then you subscribe. There's no risk and no obligation! You get 7 days free access on web, mobile & SMS and unlimited use of the product.